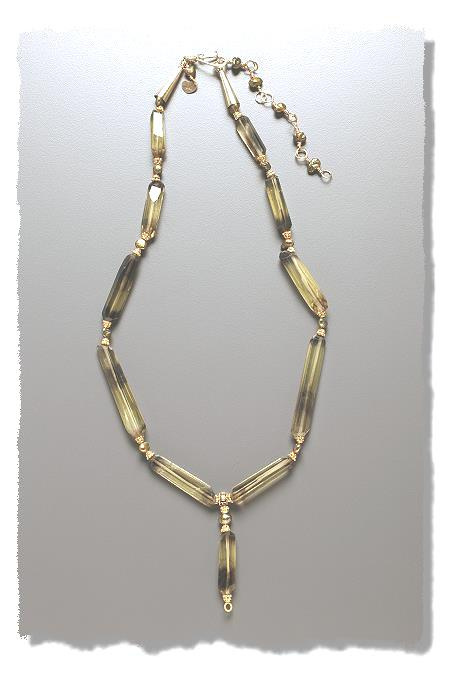 These long, faceted crystals make a charming and surprisingly delicate necklace. However, once again we have somewhat of a mystery. Though the vendor listed these as topaz, Dr. Pough does not mention greenish topaz, though Simmons and Ahsian indicate there are rare pale green ones. The brown ends of these crystals are typical of brown topaz, a common color of the species. (Not to be confused with what used to be called "smoky topaz" which is actually a dark brown quartz.) 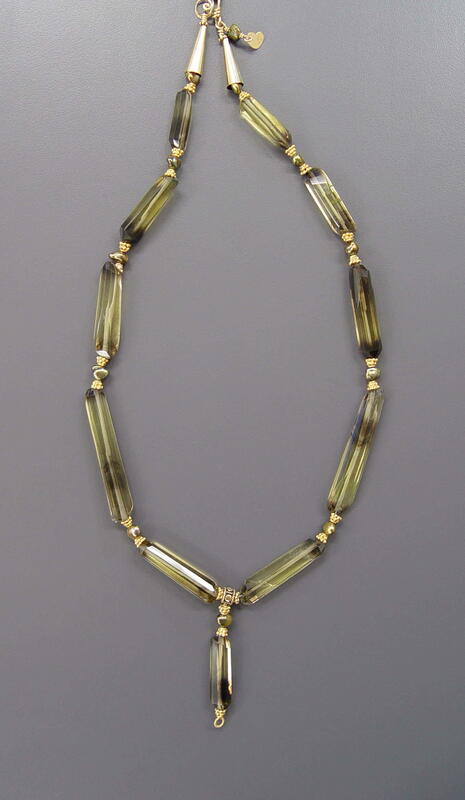 Golden colors are also typical of topaz, however these crystals have a definite greenish cast. It's barely possible greenish topaz was only discovered after Dr. Pough wrote his definitive guide in 1953, but that sounds like a convenient explanation. Wiki mentions green topaz but the article is quite short and has some odd phrasing that suggests the greens are treated in some way. In fact, when you look around you'll find amazing deep green irradiated topaz. So what's going on here? These crystals certainly don't look like the irradiated material. So, are these stones topaz or olivine? If I knew anything about mineralogy perhaps I could resolve the problem by measuring the hardness of these crystals or trying to dissolve them in hydrochloric acid, but those seem like mean things to do to pretty crystals! Far better to test them by seeing if they help to contact the fairy and devic realms as Ahsian indicates peridot facilitates. Whew! Are you still reading after that strange excursion? Perhaps you would like to have a necklace of lovely conversation-piece crystals? If so, I hope you will order this one today!